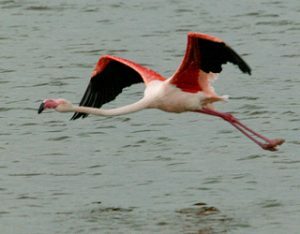 The Greater Flamingo is a bird species belonging to the Flamingo family. 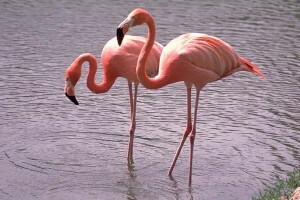 They are most widespread among all Flamingos and are found in different regions of Africa, Asia and Europe. These beautiful birds live in large colonies. Size: They grow between 43 inches and 60 inches (110 cm and 150 cm) in height. The males are larger than the females. Weight: Their body weight ranges from 2 kg to 4 kg (4.4 lbs to 8.8 lbs). Plumage: The birds have pinkish-white plumage. The juveniles are mostly brown in color with pinkish underbellies. Wingspan: Their wingspan ranges between 55 inches and 65 inches. Feathers: There are some red feathers in their wings. They also have black primary and secondary flight-feathers. Neck: They have pinkish, long necks. Eyes: The Flamingos of this species have yellow eyes. Beak: Their typical downward-bending beaks are pink with a black tip. Juvenile Greater Flamingos have brown beaks. Legs: Adults have pink legs while the legs of the juveniles are brown. They are found in various regions of Africa, the southeastern parts of Asia as well as southern Europe. In Asia, their distribution range includes the coastal areas of India and Pakistan. They are found in many European countries such as Spain, Albania, Turkey, Portugal, Italy, Cyprus, Greece and France. These birds prefer salt water lagoons in coastal areas. They also inhabit large alkaline and saline lakes. This omnivorous species feed on mollusks, crustaceans, insects, crabs, worms and small fishes. Their diet also consists of various plant materials such as algae, grass, decaying leaves and shoots. The Greater Flamingos feed with both their head and neck underwater. They also walk steadily at the same time. Their long feet are often used for stirring up the muddy bottom of the water body to find prey. They generally move in large groups or flocks like all Flamingo species. These social birds always build their nests in large colonies of over 20,000 pairs. They spend around 1/4th of their time in cleaning themselves. This species form monogamous pairs which means each pair remains together for their entire lives. The birds are very noisy, especially during the mating season. These Flamingos are generally non- territorial. But they protect their nests during breeding seasons. Mammals like Raccoons, Jaguars and Margays are known to prey on them. Their predators also include various large birds of prey. Greater Flamingo birds use their specialized beaks for filtering food. There are many comb-like plates arranged in rows inside their beaks. These plates help to filter small invertebrates and insects from the water. Their tongues are another adoptive feature that helps them to pump water through their beaks. The Greater Flamingos have webbed feet that help them to swim. This adaptive feature helps them to avoid being preyed on. Like other Flamingos, they can stand on one leg while the other leg is hidden inside their feathers. This helps the birds to conserve energy to keep from freezing while standing in cold water. Northern populations of these birds often migrate to warm regions during winter. Other reasons for their migration include scarcity of food, water-level changes and competition within a single colony. 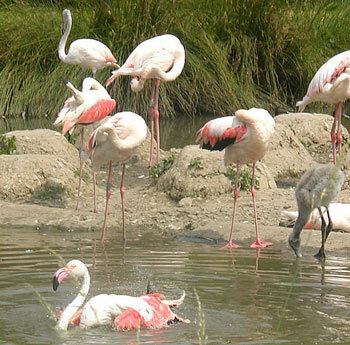 The Greater Flamingo populations living in warm climates do not migrate during cold seasons. The colonies living in the northern regions of Asia migrate to the coastal areas of India and Iran in winter. They can fly at a speed of around 300 miles/hour. The Flamingos generally glide without flapping the wings continuously. Their call is a loud goose-like honking which sounds like “ka-haunk”. The parent Greater Flamingos can identify their chick among hundreds of others by hearing its call. Breeding of the species generally takes place between the months of April and August. 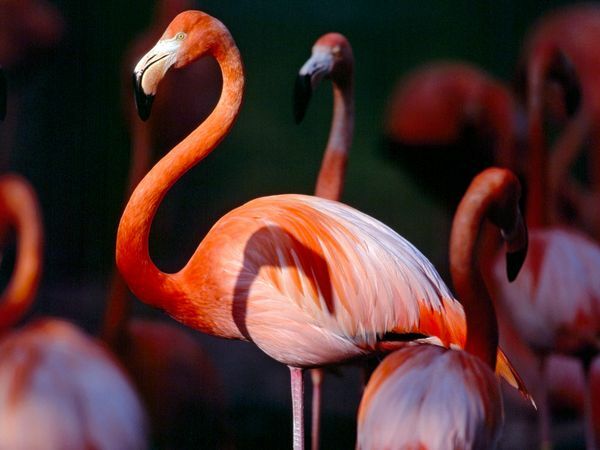 This Flamingo species become reproductively mature at 4 years of age. They display special courtship behaviors. The adult pairs build their nest with mud where the females lay a single egg. The Greater Flamingo eggs are chalky white with red yolks. Both parents participate in the incubation of the egg which takes around 30 days to hatch. The parents secrete a pink fluid called “crop milk” to feed their chicks. The chicks eat this secretion for the first 3-4 weeks after their birth. The hatchlings are able to swim and run immediately after their birth. They are grey and have straight bills which start curving when they are ten weeks old. These hatchlings start filter feeding after 75 days from their birth. The chicks become pink in color by feeding on pigmented aquatic creatures like shrimps. They take approximately 75 to 77 days to complete their fledging. The average lifespan of this specie ranges between 30 years and 40 years in the wild. But in captivity they can live for over 60 years. The Zoo Basel in Basel, Switzerland first hatched this species in the year 1959. 400 Greater Flamingos have been hatched since 2000 in this breeding program. The hatchlings were distributed among numerous zoos all over the world. 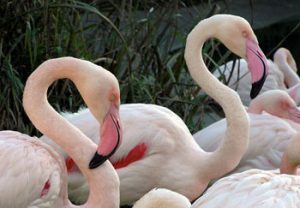 Considering the number of chicks hatched by the Zoo Basel since 1959, most of the zoo colonies of this species around the world are believed to be related to the Greater Flamingo in the Basel zoo. This Flamingo species is included in the “Least Concern” category by the IUCN. 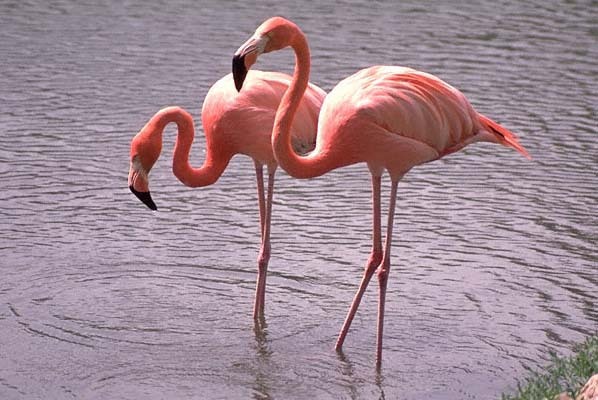 They are the largest in size among all Flamingos. This is also the palest species of Flamingo. They are the state bird of the Indian state Gujarat. The largest male Greater Flamingos grow 74 inches tall with a body weight of 4.5 kg. This species have occasionally been considered to be conspecific with their close relatives the Chilean Flamingo and the American Flamingo. But, according to the British and American Ornithologists’ Union, they are regarded as three different species. These birds are believed to be able to sleep while standing on one leg. Their pink coloration is obtained from a type of carotenoid pigments present in the crustaceans and algae they eat. Here are some images of this gorgeous bird.